Definition at line 26 of file CLGradientStop.h. Definition at line 28 of file CLGradientStop.cpp. Definition at line 41 of file CLGradientStop.cpp. Definition at line 54 of file CLGradientStop.cpp. Virtual destructor to satify the linker. Virtual destructor to satify the linker. Does nothing , is only in the source file to help the compiler in determining where to put the vtable. Definition at line 69 of file CLGradientStop.cpp. Definition at line 137 of file CLGradientStop.cpp. Definition at line 76 of file CLGradientStop.cpp. Referenced by CLGradientStops::CLGradientStops(), getLinearGradient(), getRadialGradient(), and CCopasiXML::saveGradientStop(). Returns the stop color id. Definition at line 108 of file CLGradientStop.cpp. 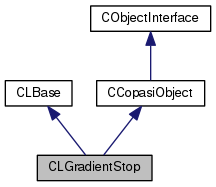 Referenced by CLGradientStops::CLGradientStops(), getLinearGradient(), getRadialGradient(), CCopasiXML::saveGradientStop(), and CLLayoutRenderer::update_colors(). Definition at line 84 of file CLGradientStop.cpp. Definition at line 92 of file CLGradientStop.cpp. Definition at line 100 of file CLGradientStop.cpp. Sets the stop color id. Sets the stop color key. Definition at line 116 of file CLGradientStop.cpp. Definition at line 124 of file CLGradientStop.cpp. References mOffset, mStopColor, and CLRelAbsVector::toSBML(). key string for the gradient stop. Definition at line 39 of file CLGradientStop.h. Referenced by CLGradientStop(), and getKey(). Definition at line 33 of file CLGradientStop.h. Referenced by getOffset(), setOffset(), and toSBML(). Definition at line 34 of file CLGradientStop.h. Referenced by getStopColor(), setStopColor(), and toSBML().